Beautiful and hard to believe not real silk. they hang very professionally. Luxe, flowing style arrives in your living space, in the form of this faux silk curtain panel, an energy-efficient blackout design that's sure to please. With insulation, pinch pleating, and a robust lining, this panel provides energy-saving, fashionable charm, for long-lasting style and functionality. I was so excited for these because they were just the right color and size. Even better was that they were blackout even though they are white, surprisingly hard to find. The price was higher than I would have liked, but these ticked all of the boxes so I was willing to pay. I should have managed my expectations. As soon as I opened the box, I knew these were wrong and not worth the money...AT ALL. First off, they are 25" wide and I did not notice that anywhere in the description (It's there now, but I was looking for it and in earnest). That's very narrow, esp. for a curtain that is supposed to wrap around a window and block out light. Second, oh boy, are these cheap looking, they almost looked like they had been sprayed with a sort of varnish. I didn't even unpack them and they went back right away. I walked to a local *** and found several other options at 20% the cost. Even *** has real silk option at this same cost. Truth be told, it cost me *** to return these and I am miffed about it. Even though I feel that these were not as described, I can't prove that at this point. But, I can caution you against making the same mistake. These are well made, heavy duty curtains. I purchase the peacock color and it's so beautiful. The only thing I would like to point out as you make your purchase is the pleating does take away some of the width. I'll have to order two more panels to fully cover our bedroom window. Outside of that they're perfect (that's my fault for not thinking to measure the width the first round). These curtains are the perfect color. These curtains are of excellent quality. I absolutely love the beautiful silvery grey color. They are a timeless style. I redecorated my entire living room with different shades of grey and these tide everything together. I wanted so much to love these curtains, but they look smooth & silky in the picture, but they are actually knobby looking. The description does say textured, but they look so smooth in the picture that I thought they would be more like that. Color was perfect, but the texture was not. And quite frankly, for the price, they should have looked smooth as silk, as they are pictured. Sadly I'm returning them. 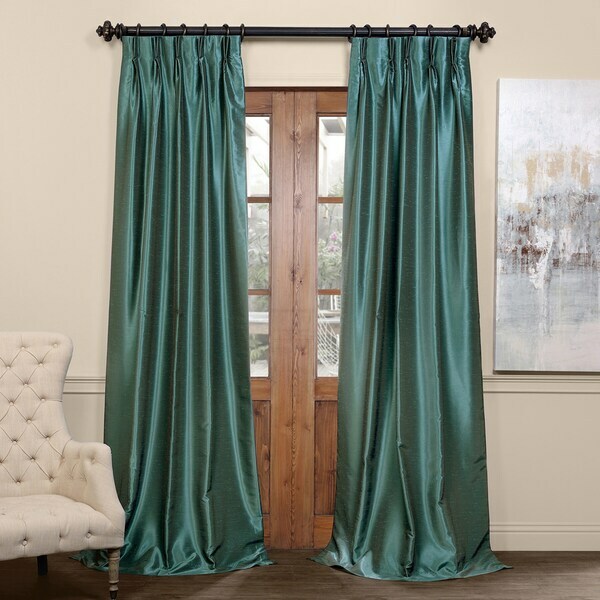 If you are looking for beautiful, luxurious draperies for an amazing price, buy these! They are true "Blackout" curtain panels, I bought them for my East facing master bedroom in dark gray and they keep the bright light out! I love them! Heavy weight, so they hang beautifully. I don't think you will be disappointed. Thank you Overstock, you saved me about *** . These are awesome panel that look just like silk & the quality for the prices cannot be beat! Love the fabric, & quality, & construction. They nicely darken the room with the lovely lining. These curtains are beautiful - unfortunately did not cover window span - the fabric is high end and looks expensive - they should make these in extra wide! I am a professional interior designer and these are in my living room. People always think they are custom made as they are the focal point on a huge bank of windows. Because of their hefty weight and fabulous lining, I have also installed these gorgeous blue panels in more than one clients' home. They cannot believe the price nor can their guests! The reason I gave these curtains a low rating is because the material does not look like what's pictured . They looked dull so I had to return them . These drapes are beautiful. Heavy, lined and weighted. We purchased the ivory and I love the color. I would not describe it as ivory. It is off-white bordering on very light gray. There is no yellow in this drape. These drapes are a bargain for the quality. The fabric has very little sheen. I would purchase again. The curtains arrived today and are gorgeous, better than expected. The color was great and the feel of the curtains was feat as well. Unfortunately, the length was all wrong. Sadly, they will be returned. Love these drapes! They are beautiful and high quality! They really complete my dressing room! The delivery time was excellent! The package was in perfect condition! Really can’t say enough positive things about Overstock.com! I’ve had excellent experiences lately!!! Color was winter white. Length was fairly consistent. Panel width was a described. Returning the extra panels was easy. Offer light darkening and insulation as described. I would order these again. The fabric truly looks like silk and the drapes are heavy and well made. The width in my opinion is perfect for a standard size double hung window, especially if you use blinds or roman shades underneath to pull down for privacy. They are significantly more of a value than the drapes website I have used in the past. I wish they had more colors though! These were gorgeous. The color was perfect! "Is there any way I could get sample swatches to decide on color?" Yes, under the sizes there is a link to "Request a Free Swatch". "So are these curtains 25" wide or 50" as the description states? Reviews are stating 25" wide." The fabric is 50" wide and is pleated down to 25" at the top for each panel. These pleated panels have the finished width of 25 inches. "Can these be hung with clip rings?" Yes, you can hang the panels with clip rings. "I have the same question: Why are the off-white curtain panels shown here not pinch-pleated like the others? Thank you"
We apologize for the confusion and are working to update the site. "Why does the off-white picture not have "Pinch Pleating"?" "What kind of hooks do I need to hold these drapes on the rod?" Any brand of drapery hooks/pins will work with our panels. They are inexpensive and can be found at any hardware store.